Consult Macquarie for a list of abbreviations and for guidance about full-stop use. Write abbreviations in full at first reference, followed by the appropriate abbreviation (or acronym) in brackets. Exception is common abbreviations (e.g. scuba, laser, Qantas, URL, QR code), which are fine to leave as an acronym at first reference. Choose the option that will least confuse the reader. Do not include full stops between initials (e.g. JD Story not J.D. Story), unless the initials are part of an official title (e.g. U.S. Best News). Always use full stops for ‘e.g.’ and ‘i.e.’ (but no comma). Avoid adopting (or inventing) obscure acronyms or abbreviations, or relying too heavily on University acronyms. It’s appropriate to use the full name at first reference, then to use generic terms like ‘the association’, ‘the group’ or ‘the committee’ in later references. When using a term in place of a specific unit with the University, capitalise (e.g. ‘the University’, ‘the Institute’, ‘the Faculty’, ‘the School’). When writing about academic programs, always use their full name at first mention (e.g. Bachelor of Commerce). If appropriate, and if the reader will understand, you can then refer to a program’s abbreviated form (e.g. BCom). Never use full stops in program abbreviations. Refer to UQ’s abbreviation finder for a full list of program abbreviations. Always use capitals when referring to Aboriginal and Torres Strait Islander peoples (e.g. 'Indigenous', ‘First Peoples’, ‘Aboriginal and Torres Strait Islander peoples', ‘Indigenous Australian peoples', ‘Aboriginal person'). Refer to an Aboriginal person by their clan if it is known (e.g. use ‘Turrbul woman Casey says that...’ rather than ‘Aboriginal woman Casey says that...’). Always use 'Aboriginal and Torres Strait Islander peoples' in full – don’t abbreviate to ‘ATSI’ or 'A&TSI'. Don't use 'aboriginal' as a noun (e.g. 'the aboriginal') and never use the word ‘aborigine’. Be conscious in your writing not to exclude or isolate Aboriginal and Torres Strait Islander peoples (e.g. stating that ‘all Australians have access to quality medical care’ excludes the lived experience of many Aboriginal and Torres Strait Islander peoples). Don’t trivialise or misrepresent important cultural beliefs and practices (e.g. don't refer to the Dreamtime as myths or legends). Don’t make assumptions about someone’s ancestry or identity based on their physical features. Terms such as ‘half-caste’, ‘full-blood’ and ‘part-Aboriginal’ should not be used. Use diacritical marks when they are a feature of a person or organisation’s name (e.g. Peter Høj). For any other word, consult Macquarie. View this handy guide to keyboard shortcuts for diacritical marks on both Mac and PC. Researchers have discovered a new species of whale (active voice – preferred). A new species of whale has been discovered by researchers (passive voice – avoid). It may sometimes be appropriate to use passive voice, depending on how you want to represent an issue. Exercise judgement, but use active voice wherever possible. Spell out street types in full (e.g. ‘Road’ not ‘Rd’, ‘Street’ not ‘St’) unless space is limited. If you do need to use an abbreviation, the Australian Bureau of Statistics offers a list of street abbreviations. Write state names out in full unless space is limited (e.g. Queensland not QLD or Qld). Use ‘adviser’ (as per Macquarie) rather than ‘advisor’. Usually, 'affect' is a verb, meaning 'to impact or change' and 'effect' is a noun, meaning 'the result of an action'. The storm affected dozens of houses in Brisbane's southside. The effect of the storm was devastating. Effect can also be used (less commonly) as a verb, meaning 'to bring about'. It is usually accompanied in this context with nouns like 'change' or 'solutions'. The researchers wanted to effect change in the policy to improve people's lives. Affect can also be used (much less commonly, usually only in specific psychology-discipline contexts) as a noun, meaning 'a feeling, emotion, or specific emotional response'. The patient had a flat affect throughout the therapy session. Only refer to age when relevant to the context, and when it is necessary use people-centric language (e.g. 'older adults' or 'younger people'). Avoid age stereotypes (e.g. old men are grumpy, old people won't adapt to new technologies, millennials are compulsive job-hoppers). ‘Alternate’ means to change between two different states, things, options, moods, or similar. (e.g. ‘I alternated between hungry and angry’, ‘the lasagne was topped with alternate layers of cheese and tomato sauce’). ‘Alternative’ means another possibility or choice (e.g. ‘If I don’t study medicine, my only alternative is to sing on Broadway.’). ‘Alumnus’ is singular and ‘alumni’ is plural. An 'alumnus' is any student who has attended UQ (e.g. exchange students are UQ alumni, even though they graduate at their home universities). A ‘graduate’ is someone who completes their degree at UQ. For female alumni, use 'alumnus' for singular or 'alumni' for plural. Do not use the Latin feminine versions 'alumna' for singular or 'alumnae' for plural – although these loanwords are traditionally associated with female alumni, UQ's preference is to use non-gendered terms, which also applies to alumni. No full stops in ‘am’ or ‘pm’ (e.g. 9am not 9 a.m.). Don’t use a space between the number and am/pm (e.g. 9am, not 9 am). am, pm, time, a.m., p.m.
Use ampersands when they are part of an official name (e.g. Dolce & Gabbana, Tiffany & Co). Some businesses use non-traditional ampersands (e.g. Black + Decker). In these situations, just use the word ‘and’ (e.g. Black and Decker). Non-traditional ampersands cause confusion for screen readers. When design restrictions limit space so that ‘and’ cannot be written in full (such as in buttons, menus or tables), it is permissible to use an ampersand. If space allows, always write ‘and’ in full. In all other situations, do not use ampersands – write ‘and’ in full. This includes organisational unit, course and program names at UQ. Use apostrophes to show possession (e.g. the cat’s whiskers) or the contraction or omission of letters or numbers (e.g. don’t, can’t, ’05). For year abbreviations, point the apostrophe toward the omitted characters (e.g. Bachelor of Science ’69). Do not use apostrophes for the plural of years (e.g. 1970s not 1970’s). A singular possessive is formed with ’s (e.g. the student’s hat); plural possessive is with s’ (e.g. the students’ hats); for a word ending with s the possessive is with ’s (e.g. the class’s performance); almost all plural word possessives are with s’ (e.g. the kids’ lunches) unless they do not end with an s (e.g. the women’s conference). Use apostrophes for plurals of single letters, but not numbers or multiple letters (e.g. mind your p’s and q’s; he received mostly 7s; they were born in the 1970s; she checked the FAQs). Don’t use apostrophes for plurals of abbreviations that have become accepted or widely used words (e.g. TVs, DVDs, PhDs, FAQs). When writing about expressions of time, include an apostrophe for singular expressions (e.g. one year’s time, one day’s salary) but no apostrophe for plural expressions (e.g. two weeks time). Avoid archaisms, which are phrases or words that are considered outdated (e.g. ‘whilst’ – use ‘while’, ‘amongst’ – use ‘among’, and shall – use 'will’). UQ's written voice for most audiences should be approachable, and archaisms create an impression of pretension and elitism. As some legal documents (such as contracts) use archaisms, it is appropriate to use archaisms in a legal context. Articles indicate whether a noun is specific (called a 'definite article' – 'the') or unspecific (called an 'indefinite article' – 'a' and 'an'). For words beginning with 'h' that require an indefinite article, decide whether to use 'a' or 'an' based on the word's pronunciation. Use 'an' with words where the 'h' is not pronounced (e.g. They were away for an hour.). Use 'a' with words where the 'h' is pronounced (e.g. They went to a hotel.). Not bachelors degree or bachelor degree. Use an apostrophe, and don’t capitalise unless part of a degree title (e.g. Bachelor of Arts, bachelor’s degree in arts). Always write out dual degree titles in full (e.g. ‘Bachelor of Journalism / Bachelor of Arts’ – do not abbreviate to ‘Bachelors of Journalism/Arts’). Use (round brackets) for general communications. clarifying information within quotes (e.g. “He [Mr Jones] was so rude to me,” Ms Chan said). Capitalise the official names of campus buildings, as well as levels and room designations. Do not capitalise the word ‘room’, ‘building’, or ‘campus’ unless it forms a part of an official name (e.g. Campus Travel can be found at the St Lucia campus; I visited the JD Story building). Note: the style of bullets in this entry is indicative only. UQ does specify a preference for bullet style – this usually depends on the style of a publication or website. Three types of bulleted lists exist: simple lists, bulleted lists made up of complete sentences, or bulleted lists used within a sentence. Here is my first point. This first point is made up of two complete sentences with correct punctuation, including full stops. This is my second point. This second point is made up of two complete sentences with correct punctuation, including full stops. This is my third point. This is the end of my list. If the preceding text and bullet points form a complete sentence, capitalise and punctuate as you would any ordinary sentence or list, and finish the final bullet point with a full stop. Use commas rather than semicolons at the end of each list item. you fail 50 per cent or more of your enrolled units for a given semester. A fail is any grade less than 4. Do not capitalise ‘campus’ unless it forms a part of an official name (e.g. Campus Travel can be found at the St Lucia campus). When referring to campuses, say either ‘UQ St Lucia’, ‘UQ Gatton’, ‘UQ Herston’ or ‘St Lucia campus’, ‘Gatton campus’, ‘Herston campus’. Do not use both in combination as a general rule (don’t say ‘the UQ St Lucia campus’); however, for media releases sometimes this is appropriate. Use sentence case/minimal capitalisation in headings and subheadings. Use a capital for the first letter of the first word, with subsequent words in lower case. Use lower case after a colon (e.g. Carving a history: a guide to the Great Court). When referring to the brand (as a noun), always write ‘Create change’ with an upper-case ‘C’ followed by a lower-case ‘c’, even in the middle of a sentence (e.g. ‘OMC uses Create change design elements for all student-facing documents.’). When using ‘create change’ generally, use lower case or normal sentence capitalisation (e.g. ‘Gina aims to create change with her new business.’). When writing the name of the campaign in full, always write the first three words in italics, and use title case. Separate the name and subhead with an en-dash, not a full stop: Not If, When – the Campaign to Create Change. After you have written the name of the campaign in full, if you need to refer to the campaign in subsequent references you can either write a shortened, sentence-case version of the campaign name (the Not if, when campaign) or just say 'the campaign'. Capitalise high public office titles (e.g. Prime Minister, Treasurer, Attorney-General) and royal titleholders (e.g. the Queen). Do not capitalise specific job titles for non-UQ people (e.g. ‘Tim Cook is the chief executive officer of Apple.’) – note that this may not apply depending on the style of the specific UQ publication you are writing for. Do not capitalise occupations (e.g. lawyer, doctor, scientist, magician). Do not capitalise season names (e.g. spring, summer, autumn and winter). Do not capitalise the names of diseases (e.g. pertussis, meningococcal) unless they are named after a person or place (e.g. Ebola, Alzheimer's). set periods of time (e.g. Semester 1, Semester 2, Trimester 1, Trimester 2, Trimester 3, Year 1, Year 2, Week 1, Week 2, Week 3, Mid-Semester Break, Year 12 student). Do not use a full stop at the end of captions that are a label or fragment (e.g. ‘Michael J Jones with tennis buddies’). Use a full stop at the end of a caption if it is a full sentence (e.g. ‘Michael J Jones practises his swing with his tennis buddies.’). Do not italicise captions unless it is a hard-coded format for a page. Use full academic titles in captions. Spell out centuries in text according to standard number rules (e.g. first century, 21st century). Not chancellory. ‘Chancellor’, however, is correct. ‘I love my parents, Lady Gaga and Humpty Dumpty’ implies that Lady Gaga and Humpty Dumpty are your beloved parents. This should be written as ‘I love my parents, Lady Gaga, and Humpty Dumpty’. 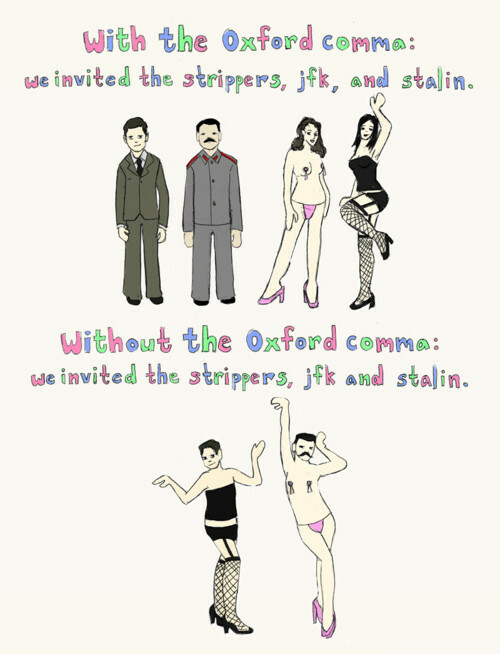 This example demonstrates the need for an Oxford comma in a visual way. ‘I had bacon, eggs and toast’ is not ambiguous so does not require an Oxford comma. Use an Oxford comma for in-sentence lists where multiple items are linked with ‘and’: ‘He bought gin and tonic, soda water and lime, and vodka as a round for the whole team.’. Use common contractions such as ‘can’t’, ‘you’ll’ and ‘don’t’ for most audiences, but avoid ‘should’ve’, ‘could’ve’, ‘would’ve’, ‘mightn’t’ and ‘mustn’t’. Do not use contractions for media releases or for more formal contexts, such as condolence letters or the Annual Report. Exercise judgement on when they would be most effectively used for an approachable tone and if they are appropriate for your audience. Avoid negative constructions that include ‘cannot’, ‘should not’ and ‘must not’ – rewrite positively where possible. The University uses ‘course’ to refer to the individual study components that make up a degree program (e.g. ‘She is studying four courses in Semester 1.’). A ‘subject’ is a specific branch of knowledge or a theme (e.g. ‘The subject of the lecture was Chinese philosophy.’). Capitalise official course titles (e.g. Auditing and Public Practice, Introduction to Web Design). Do not use ampersands in course titles – always spell out ‘and’ in full. Use one word (e.g. ‘master’s by coursework’ not ‘master’s by course work’). When using ‘create change’ generally (verb/noun), use lower case or normal sentence capitalisation (e.g. ‘Gina aims to create change with her new business.’). Always use numerals (e.g. $1.50, $3, $1 million). Spell out up to $1 (e.g. 99 cents not $0.99). Use numerals up to $1 million (e.g. $999,999) but spell out after (e.g. $1.5 million, $1 billion). For dollar currencies, use the appropriate letter or letters before the dollar sign (e.g. A$150, US$20,000). Note that UQ's preferred style is to use letters and the dollar sign (A$) rather than a three-letter code (AUD). For non-dollar currencies, place the relevant symbol immediately before the numerals (e.g. ¥15,000, €250, £375). Note that UQ's preferred style is to use letters and the dollar sign (A$) rather than a three-letter code (AUD). Start using commas in numbers only when the dollar amount reaches $10,000. The only exception to this rule is for documents supplied or used by UQ’s finance teams, such as in the Annual Report, where commas in four-digit numbers are essential for figure alignment in tables. Use hyphens to join words in a compound construction (e.g. eight-page document, re-read a book, x-ray) – check Macquarie if in doubt about whether to hyphenate. Use en-dashes with no spaces on either side for ranges and terminal points (e.g. two–three weeks, 80–100 people, 9–10am, Brisbane–Los Angeles flight). Use en-dashes with spaces on either side in a similar way to brackets or commas to indicate a break or a pause in a sentence (e.g. ‘Despite being sick all year, Jasmine – with help from her coach – won an Olympic gold medal.’). UQ doesn’t use em-dashes in any communications or publications except the Annual Report, which must follow AGPS style according to the guidelines. View this handy guide to keyboard shortcuts and HTML values for dashes on both Mac and PC. UQ’s preferred date order and format is Day Month Year (e.g. 1 January 2013, 16 July 2017, Tuesday 28 February 2017) – note there are no commas after the day or month. Don’t use ordinal numbers in dates (e.g. 1 January not 1st of January or January 1st). Use an en-dash with no spaces on either side to separate periods of time when referring to the whole time (e.g. ‘from 2008–09’ not ‘from 2009/2012’); use ‘and’ when referring to periods between dates (e.g. ‘between 2008 and 2009’ not ‘between 2008–09). Do not include apostrophes when referring to a decade (e.g. use 1970s not 1970’s). If space is tight, consult Macquarie for the best abbreviations to use for calendar months. Students enrol in programs and are awarded degrees – a program is an approved sequence of study that leads to the award of a degree qualification. Capitalise the full and formal names of specific programs (e.g. Bachelor of Architectural Design, Doctor of Philosophy). When referring to programs, disciplines or degrees in general ways, use lower case (e.g. studying arts; courses about politics; bachelor’s degree; undergraduate programs). Higher degree by research (HDR) programs at UQ include the Doctor of Philosophy (PhD), the Master of Philosophy (MPhil) and the Doctor of Biotechnology (DBiotech) - note these were previously called Research Higher Degrees (RHD). Note hyphenation – not Deputy-Vice-Chancellor or Deputy Vice Chancellor. Usage of 'neurone' and 'neuron' varies in Australian English. For consistency, at UQ use ‘neurone’ (with an 'e') only when writing 'motor neurone disease', and for all other references use ‘neuron’. If an email address doesn’t fit on one line, break the address before the @ symbol or at a full stop. Don’t use hyphens when breaking an email address. Use ‘enquire’ in a general sense as a substitute for ‘ask’ or ‘question’. Use ‘inquire’ when you mean a formal investigation into something (e.g. School of Historical and Philosophical Inquiry, a police inquiry, scientific inquiry). Capitalise the proper names of UQ’s faculties, schools, research institutes and centres. Use lower case ‘university’, ‘faculties’, ‘schools’, ‘institutes’, or ‘centres’ if you are using these words in general ways or for a plural (e.g. ‘UQ has six faculties.’). Use upper case ‘University’, ‘School’, ‘Institute, ‘Centre’ or ‘Faculty’ if you are using these words to stand in for a specific body or an official title (e.g. ‘He advised the School has expertise in the arts.’). Always use all caps (not Fee-Help or fee-help). Use a space before and after a forward slash when writing groups of words (e.g. Bachelor of Commerce / Bachelor of Arts; Foreign Correspondence Manager / Corporate Relations Adviser). Don’t use spaces when you use a forward slash to stand in for ‘per’ (e.g. $800/week, 60km/hr), or when you are separating small words or values (e.g. his/her, he/she, and/or, 8/9). If using a space improves readability, use one. Only use one space after full stops. Do not include full stops between a person’s initials (e.g. JD Story not J.D. Story) in any context, unless the initials are part of an official title (e.g. U.S. Best News). Never use full stops in program abbreviations; refer to UQ’s institution and qualification abbreviations for a full list of program abbreviations. Make sure text is inclusive. It is fine to use the singular ‘they’ or ‘their’ if you need to (e.g. ‘A student should bring their calculator to the exam for inspection’). A researcher must be confident in their findings. Researchers must be confident in their findings. As a researcher, you must be confident in your findings. Capitalise for specific degrees (e.g. a Graduate Certificate in Writing, Editing and Publishing). Use lower case for general use (e.g. She’s completing a graduate certificate). Macquarie spells 'groundbreaking' as one word with no hyphen. For correct use of hyphens in compound nouns and adjectives, refer to Macquarie. vessels (the Enterprise is the only shuttle on display in New York). uncommon words and phrases from other languages (e.g. The French word for dog is chien); however, always check Macquarie first – if the word isn’t italicised in Macquarie, there’s no need to italicise it in your writing. scientific names of plants and animals (e.g. the kangaroo, or Macropus macropodidae, is common in parts of Australia). hyperlinks (in web content); research shows conventional formatting rules for hyperlinks (blue, hover underline) draw attention to words when a user is scanning, so adding italics creates an additional layer of formatting that detracts from simple, effective and widely used conventions. Always capitalise nationalities and languages (e.g. Australian, English, French). The words 'lead' and 'led' are commonly confused. The word 'lead' has many definitions (including the metal commonly used in plumbing), but the confused definition is usually the present tense of the verb meaning 'to guide, conduct, or bring on a particular course'. The past tense of this verb is 'led', not 'lead' (even though the latter when meaning a metal is pronounced in the same way as 'led'). If a URL can’t fit on one line, the break should come before a full stop, single slash, or other punctuation mark. If a URL is so long that it breaks a line, consider using a link shortener such as bit.ly, especially if you are writing for print. Email addresses should sit on one line wherever possible. If an address doesn’t fit on one line, break the address before the @ symbol or at a full stop. Don’t use hyphens when breaking an email address. Avoid line breaks that create widows (a single line at the end of a page) and orphans (a single line at the beginning of a page). Avoid lines breaking with only one word on the next line; either change tracking to condense the stray word onto the previous line, or add a line break before the second-last word in the paragraph. Not masters degree or master degree. Use an apostrophe, and don’t capitalise unless part of a degree title (Master of Science; master’s degree in science). Spell out measurements (‘St Lucia campus is six kilometres from Suncorp Stadium’ – not six km or 6km). Use a hyphen (rather than a space) for when a number formed by numerals and the identifying measurement form a compound adjective (e.g. 1068-hectare Gatton campus, 25-metre pool). When space is limited it is appropriate to use abbreviations; see Macquarie for a full list. However, if space allows, always write out measurements in full. Present personal names in the same order they would appear in the person’s home country (particularly for Asian names). If in doubt, check the person’s preference. If a person’s name includes a particle – such as ‘van’, ‘der’, ‘de’ – check the person’s preference for capitalisation of the particle (e.g. 'John Van Der Waas' or 'John van der Waas' are both acceptable depending on John’s preference). academic scores (e.g. GPA 7, OP 1. Include a space between the score type and number, unless space is limited. This follows QCAA convention). Use a comma only after five numerals (e.g. 1200 not 1,200). Exception: documents supplied or used by UQ’s finance teams, such as in the Annual Report, where commas in four-digit numbers are essential for figure alignment in tables. Use decimals rather than fractions (e.g. 0.5 not 1/2) or spell out. Exercise judgement about whether a fraction needs to be spelled out – ‘3.5–4.5 years’ becomes long and less readable when spelled out in full. Whichever option you choose, aim to be internally consistent within a story/publication. Use numerals up to 1 million (e.g. 999,999) but spell out after (e.g. 1.5 million, 1 billion). Hyphenate fractions when they are spelled out (e.g. UQ technology is used in two-thirds of the world’s MRI machines). O-Week (not OWeek, O Week or O’Week) is the name of UQ’s orientation week. O-Week is the official start to several weeks of activities for new and continuing students. Note: O-Week used to be called O-Fest, but from 2019 UQ is reverting to calling orientation 'O-Week'. only include well-known or widely used acronyms when used within UQ (e.g. PhD, QAAFI). Use ‘Australian Government’ for Australia’s governing body (not ‘Commonwealth of Australia’ or ‘Federal Government’); however, in general terms, the ‘Commonwealth of Australia’ is the legal entity established by the Constitution, so grants and agreements will be in the name of the Commonwealth of Australia – in this instance, Commonwealth is always capitalised (see Australian Government Branding Guidelines). Capitalise the words ‘government’, ‘parliament’, ‘senate’, etc. only if they are part of a formal title. Use lower case when these are used in a general way (e.g. The Australian Government is responsible for specific policies. The government proposes a new policy. This policy will be reviewed by the Australian Government annually.). Use the term(s) ‘federal government’, ‘state government’, and/or ‘local government’ (note lower case) to distinguish between the three levels of government where necessary. Always use ‘per cent’ (not percent). When design restrictions limit space so that ‘per cent’ cannot be written in full (such as in buttons, menus or tables), it is permissible to use %. If space allows, always write ‘per cent’ in full. If using %, use it consistently through the section you need to use it (i.e. if you need to use % in a table where space is constricted, use it consistently throughout the table; however, you do not then need to use % instead of 'per cent' throughout the rest of the publication/website). This is the preferred format for publications such as UQ Update, which are sent to all staff, including those who work from home or off-site and can’t access UQ’s phone system. For web content, ensure phone numbers work on mobile by using the following code (change number as required): <a href="tel:33651111">3365 1111</a>. Use ‘placement’ if you need a general term to describe any activity where a student gets to apply their classroom knowledge in a work setting. Other words, such as ‘internship’, will mean different things to different audiences (e.g. a medical internship is different to a marketing internship). If you are ever unsure, just use ‘placement’. Spell out ‘Queensland’ in full (not ‘Qld’ or ‘QLD’) unless space is limited. If space is limited, use 'Qld' instead of all caps. UQ's Policies and Procedures Library (PPL) contains all of UQ's procedures, policies and guidelines that provide the framework for UQ's operation and activities. When writing for a general audiences (e.g. students, external stakeholders, alumni), if you are referring to a policy, procedure or guidelines from the PPL, refer to it by using the relevant name. Don’t use the document number, and don't use italics (e.g. 'See the Higher Degree by Research Examination Policy', not 'See 4.60.08 Higher Degree by Research Examination Policy'). When writing for staff, if you are referring to policies, procedures or guidelines from the PPL, refer to it by using the relevant name, followed by the number in square brackets. Don't use italics (e.g. 'See the Higher Degree by Research Examination Policy [4.60.08]'). Where possible, direct readers to a specific section of a policy, procedure or guideline (e.g. 'To learn more about oral examinations, see section 9 of the Higher Degree by Research Examination Policy.' – reference to the actual section here helps the reader navigate to the most relevant information). Not Pro Vice-Chancellor or Pro Vice Chancellor. Avoid using synonyms for ‘said’. e.g. “It’s ground-breaking technology,” she said (not ‘said she’). e.g. “It’s ground-breaking technology,” Dr Parker said (not ‘said Dr Parker’). e.g. “It was a great course…one of the best,” she said. When writing quotes that run over more than one paragraph, omit the closing quotation marks on all paragraphs except the final one. e.g. “I had always loved education but I had probably taken it for granted until I came to Brisbane,” Milbourne said. “UQ set me on a completely different path and I think that’s where I really grew. e.g. “He [Mr Jones] was so rude to me,” Ms Chan said. Use double quotation marks for direct quotes, and use single quotation marks for quotes within quotes. titles of essays, lectures, poems, or songs (e.g. “You’re the Voice” from John Farnham’s Whispering Jack). Use single quotation marks to draw attention to single words or phrases that aren’t direct speech (e.g. click the ‘Financial’ tab in mySI-net). Avoid ‘scare quotes’ – using quotation marks for emphasis – as they can seem insincere, sarcastic, or suggest the opposite meaning to what was intended (e.g. Mrs Lovett’s pies contain a ‘special ingredient’; UQ offers the ‘best’ programs). Use lower case for season names (e.g. spring, summer, autumn and winter). Capitalise 'week' and 'semester' when referring to the academic calendar and use numerals (e.g. Semester 1, Week 9). Use lower-case 'week' and 'semester' in other instances. For non-UQ audiences, always use ‘the UQ Senate’ first, then ‘the Senate’ for subsequent mentions. For internal UQ audiences, use ‘the Senate’, unless you need to distinguish the UQ Senate from the Senate of Australian Parliament; then use ‘the UQ Senate’. Refer to members as ‘Senate members’ (don’t call them ‘Senators’) – this is consistent with the University of Queensland Act 1998. Use one space after a full stop, not two. Use Australian English; Macquarie Dictionary is UQ’s standard reference. Never use American spelling (e.g. color, organization), unless it is part of an official title or name (e.g. Pearl Harbor, World Health Organization). Write 'startup' (def: a newly formed business) as one word with no hyphens. Note this is a different spelling to Macquarie, but is approved by UQ E&I as the industry-accepted term, which is also now adopted by the Queensland Government. Use this term broadly to describe voluntary organisations, non-government organisations or private–public partnerships (the first and second sectors are public and private enterprise). Use a full stop between hours and minutes (not a colon); don’t use .00 if the time is on the hour (e.g. 9am, 9.30am not 9.00am, 9:30am). Use 12 midday and 12 midnight where appropriate to avoid confusion (e.g. ‘Applications are due at 12 midday on 13 June.’). Use an en-dash between two periods of time and don’t repeat am/pm for times in the same half of the day (e.g. 9am–5pm, 4–8pm). Always use ‘from’ and ‘to’ together when referring to a time/date (e.g. from 9am to 5pm). Use an en-dash with no spaces on either side to separate periods of time when referring to the whole time (e.g. ‘from 9am–5pm’); use ‘and’ when referring to periods between times (e.g. ‘between 9am and 5pm’ not ‘between 9am–5pm’). Avoid using the words ‘biweekly’ (meaning either twice a week or every two weeks), ‘fortnight/fortnightly’ (every two weeks), ‘biannual/biannually’ (twice a year), ‘biennial/biennially’ (once every two years). Instead, spell out to remove ambiguity, especially for international readers (e.g. The sessions will be held once every two weeks). If it is necessary to give a title to a non-academic rank holder, use ‘Mr’ and ‘Ms’ rather than ‘Miss’ or ‘Mrs’, unless otherwise requested. For visiting international academics, refer to them by their international rank. in fields other than human medicine, regulatory bodies (such as the Veterinary Standards Board, Dental Board and Psychology Board) require that practitioners only use the title ‘Dr’ in context with their degree postnominals or in a way that could not mislead the public to think they are a human medical professional. For UQ honorary doctorate recipients, visit Copybank for instructions on correct naming conventions. (abbreviations are shown after full titles below. Note hyphenation in full titles and spacing in abbreviations. In written communication and stories, use full title and name and then [title] [last name] as per advice under academic rank holders below). Deputy Chancellor. Do not abbreviate. Vice-Chancellor and President. Do not abbreviate. For international audiences, reverse order: President and Vice-Chancellor. Deputy Vice-Chancellor (Academic). Abbreviation: DVC(A). Deputy Vice-Chancellor (External Engagement). Abbreviation: DVC(EE). Deputy Vice-Chancellor (Research). Abbreviation: DVC(R). Pro-Vice-Chancellor (Indigenous Engagement). Abbreviation: PVC(IE). Pro-Vice-Chancellor (Teaching and Learning). Abbreviation: PVC(T&L). Level A: Associate Lecturer. Title: Dr (if they have a PhD). Level B: Lecturer. Title: Dr (if they have a PhD). Level C: Senior Lecturer. Title: Dr (if they have a PhD). Level D: Associate Professor. Title: Dr (if they have a PhD). Level E: Professor (no abbreviation for subsequent mentions). Honorary: Adjunct Professor (same rules as above depending on their level at another institution). Honorary: Emeritus Professor. Do not abbreviate. See: UQ PPL 5.20.16). Plural is ‘emeritus professors’, not ‘professores emeriti’ unless for a formal/traditional purpose; note all lower case for plural (e.g. ‘Emeritus Professor John Smith AO presented at the conference along with other emeritus professors. Emeritus Professor Smith is well known to the group as a prolific philanthropist.’). Level E: Professorial Research Fellow, Senior Principal Research Fellow. If you’re ever unsure what title to use, ask the person what their preference is. Contact protocol@uq.edu.au for advice about acknowledgements or protocol events. Full name: The University of Queensland (capitalise ‘The’ even in the middle of a sentence). Only use the full name once with ‘UQ’ in brackets after, then use ‘UQ’ for subsequent mentions (e.g. 'The University of Queensland (UQ) is an idyllic environment. UQ is a great place to study.'). When referring to ‘the University’ without its full title, use a capital ‘U’ without capitalising ‘the’. Do not use a capital when using the word ‘university’ in a general way (e.g. ‘recruitment activities for the University have been growing’; ‘he applied to study at university’). UQ Library is the collective name given to UQ’s library branches (Social Sciences and Humanities Library, Biological Sciences Library, Fryer Library, Dorothy Hill Engineering and Sciences Library etc.). Capitalise ‘UQ Library’ when using it as an umbrella term for all branches. Note that first reference to the Vice-Chancellor should always use his/her full title: Vice-Chancellor and President (or President and Vice-Chancellor for international audiences). Macquarie lists the Australian spelling for this word, meaning 'a person who studies volcanoes and volcanic phenomena', as vulcanologist, not volcanologist. Use lower case for all URLs and email addresses when they must be included. Don’t include the ‘http://’ or ‘www.’ part of the web address, or the final forward slash at the end of the address (e.g. ‘google.com’ not ‘http://www.google.com/’ or ‘www.google.com’). Don’t include hyperlinks in headings. Where possible, hyperlink text to a website rather than including the URL in-text. For conventions regarding including links in text, view the ITS web content guide. When writing a URL in a sentence, rewrite the sentence where possible to avoid the URL being at the end of the sentence. Where this isn't possible, use a full stop at the end of the sentence even if it is after a URL. If a URL can’t fit on one line, the break should come before a full stop, single slash, or other punctuation mark. If a URL is so long that it breaks a line, consider using a link shortener such as bit.ly. Always check a URL before shortening it, as some older UQ sites require the ‘www’ to work properly; if a site requires the ‘www’ to load, include it. A website is a collection of linked web pages. At UQ, websites can be identified by their distinct headers. For example, this is the Faculty of Medicine website, and this is the ChangeMakers website. A web page is any page that sits within a website. For example, this Written Style Guide web page is part of the Office of Marketing and Communications website. Spell 'website' as one word, and 'web page' as two words, per Macquarie. For more information on websites and web pages at UQ, view the ITS web content guide. Always hyphenate ‘world-class’ (not only as compound adjective). This A to Z guide to written style at UQ is an authoritative guide for staff when writing any internal or external communications and marketing materials across all print and digital media. This guide is kept up to date by a working party that meets regularly. We welcome your feedback about errors, omissions, entries that you think are unclear, or items you think should be altered. Looking for approved, regularly updated UQ marketing copy you can use as-is or adapt for your marketing or communications?